For many global businesses, the benefits of a tactile visual planning often have to be eschewed in favour of sharing plans electronically. Electronic plans, of course, feel more modern and make it easier to share between geographically remote sites and with co-workers who travel, but you lose some of the realness of physical boards. Engadget reports on a what I think is really cool idea of building their calendar from Lego and solving the remote site problem with some software that allows a photo of the calendar to be synchronized with an online calendar. And because they use colour to represent different clients, confidentiality is still maintained even when visitors look at the chart. I think this idea has a lot of potential for even wider use, and not just because I want an excuse to play with the Lego that still often covers our living room floor. 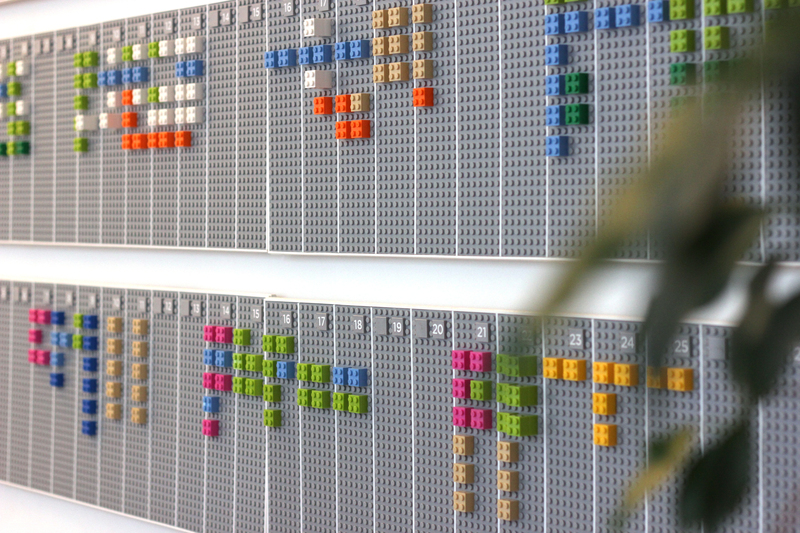 Why not create a daily task chart or even a process map in Lego. It’s maybe not right for every situation, but for dealing with those people who have become allergic to PostIt notes or even brown paper, it’s something different. And we know the bricks won’t fall off when you put your visual plan on the wall! This entry was posted in visual planning. Bookmark the permalink. Post a comment or leave a trackback: Trackback URL.